Local lad Phil Boersma spent the majority of his time at Anfield having to settle for the role of substitute and stand-in striker due to the intense competition for places. Just look at the forward line he had to compete with for a starting place in the form of Kevin Keegan and John Toshack! 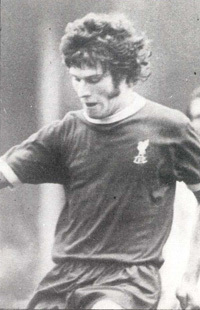 He did make an appearance as substitute in the 1973 UEFA Cup victory over Borrusia Monchengladbach though when he came on for Steve Heighway and although he missed out on the 1974 FA Cup Final against Newcastle he did play at Wembley in the Charity Shield against Leeds three months later. Frustrated by his lack of first team opportunities Boersma left Anfield to join Middlesbrough in December 1975. A good friend of Graeme Souness, Boersma returned to Anfield with Souness in 1990 and became physiotherapist and first team coach. He left when Souness resigned as Reds boss and then occupied similar roles with the former Liverpool boss at Southampton, Benfica, Galatasary and then at Blackburn Rovers. The statistics of matches and goals at the top is included in the table by the conducted player of a reserve in a seasons 1968-69, 1969-70, 1970-71, 1971-72, 1972-73, 1973-74, 1974-75, 1975-76 not completely.